We are living in a time of unprecedented scientific, technical and technological advancement, yet we are faced with critical issues that threaten our welfare, development and survival. Shaping human attitudes and behaviors towards resolving issues, restoring hope and building community within a given geographical sphere is a global challenge. It becomes particularly urgent when society at large is being driven to a state of extreme hopelessness. In such a situation, the community will welcome any initiative aimed at the improvement of their livelihood and promises solution of their local problems. Mere acquisition of resources don’t drive economies and impact people’s life standards any more. It is the investment in higher education sector and applied scientific research that impacts people, drives economies, sustains growth, inculcates positive changes in attitudes and ensures all round development within a society. The higher education institutions play a decisive role in leading the nations towards position of honor, prestige and strength. The depth and interdisciplinary nature of research at institutes of higher learning sparks creative, imaginative and inventive insights and offers solutions to real life problems. Having emerged in July 2012 on the higher education landscape of Pakistan, the University of Haripur (UOH), envisions a research based, quality conscious and demand driven future to acquire excellence in diverse fields to restore hope and build community at large. We aspire to achieve and maintain high standards in every sphere of our teaching and promote an open, collaborative and novel culture of applied scientific inquiry to improve the lives and livelihoods of the people. 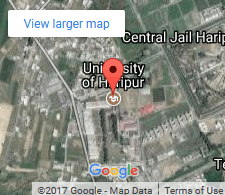 Lying at the confluence of two industrial estates (namely Hattar Industrial Estate and Gadoon Amazai Industrial Estate) and the main CPEC route, the University of Haripur enjoys unprecedented strategic importance. We believe that UOH is not just as a hub of knowledge, it is rather a place of higher learning that can have a profound role in influencing community and creating a climate for socio-economic development. To establish and promote an innovative and research based culture, where scientific dreams are transformed into reality, UOH has carved out its Strategic Plan (2014-2019) marked by a bond between academia, industry and community. We want to present our country with a different sort of enlightened minds, responsible citizens and trained human resource. We mean to make a difference. In this regard, we are heavily investing in our physical and technological infrastructure development, promotion of applied scientific research, human resource development, and establishment of linkages with institutions/organizations of global repute and placement of an efficient, transparent and credible management set up. University of Haripur (UOH) is taking initiatives at different levels to establish and optimize organization of its business processes. An important step towards this is d-digitization of UOH through Enterprise Resource Planning (ERP) project, a category of business-management software using a set of integrated modules. The system will facilitate collecting, storing, managing and interpreting data of all the university activities including academic, administrative and financial management. The university has made a major headway in implementing many of its modules and we expect to complete the process very soon. We are open to help, support, guidance and facilitation. Let’s join hands to take UOH to new heights of academic horizons and research vistas. It is just beginning of a new journey in the realm of education and technology. May Allah Almighty help and guide us.